6 weeks ago we welcomed our little baby girl into the world; as a way of remembering the experience I wanted to share our birth story on my blog. Throughout the whole of my pregnancy I was extremely lucky; I hardly suffered with any morning sickness and my only complaint was swollen feet in the last trimester. I really did think that because I'd been so lucky throughout that I was destined to have a frustratingly long and painful birth.. but oh how wrong I was! My due date of the 2nd September came and went with no signs of labour beginning and for the next week I patiently sat and caught up on Bake off, Netflix documentaries, cheesy rom-coms and daytime tv. I'd nested my heart out already so everything was ready in the nursery so I just took the time to relax. On the 6th September I went to see my midwife for a sweep; something I'd been petrified about in the days running up to it.. but I kept telling myself that the quick slightly uncomfortable feeling I was likely to experience should be the least of my worries with the birth due to happen in the very near future. As a result of the sweep my midwife found that I was in fact 2cms dilated and 100% effaced; she was pretty shocked that I'd not felt any contractions already. She confidently said to expect labour to start in the next 24 hours and that I was likely to experience my waters breaking- something that not all women actually experience contrary to what you see in the movies. I waddled out of the doctors surgery with a huge smile on my face and feeling rather pleased that my body had managed to get me to this point without putting me through any pain! For the next 2 days I again rested up on the sofa, conscious of every twinge/ movement and hoping everything would begin before having to go in for another sweep the following week. By Friday morning I'd given up hope of anything happening off the back of the sweep so decided to get myself showered and dressed in preparation to head off into town to do some shopping. As I stepped out of the shower I felt a gushing sensation... but, being over 9 months pregnant I couldn't work out whether it was just a bit of an accidental wee or whether my waters had actually just gone! Just as a precaution we decided to head up to the hospital to be checked over; at this point I was convinced that I'd just pee'd myself to be honest so hadn't got my hopes up. Once at the hospital they took some swabs and hooked me up to the monitors to keep an eye on baby's movements- after about an hour the midwives came and confirmed that in fact my waters had broken! Great news right? Nope... I wasn't experiencing any contractions and if nothing started within 48 hours I'd need to be induced. Hearing this news bought me to tears; a mixture of excitement knowing we'd soon be meeting our baby girl and also disappointment as being induced was the last thing I wanted to go through- I'd heard stories of it being super painful and also I knew I wouldn't be able to use my TENS machine. After being given a load of leaflets and some disposable thermometers to keep an eye on my temperature we were sent off home to wait it out. Once we arrived home we both felt a little deflated and both agreed that the only way to keep ourselves occupied was to carry on as usual.. so, Friday night, pub night! We headed down to our local at around 5pm, sat outside in the last of the summer sun and had a quick drink. We then popped into the indian takeaway to pick up our dinner. When we got back home I decided to sit on my birthing ball whilst eating my curry just to see if I could get things going but wasn't that hopeful. Curry finished, PJ's on and Narcos playing on Netflix we were set the evening; but after about 15 minutes I started to get stomach ache.. it felt like one you'd get after eating too much so nipped to the loo. I then realised it wasn't a stomach ache.. my contractions had started! I won't fluff it up for you.. the contractions at this point were very uncomfortable; so much so that I was doubled over in the bathroom crying and feeling really scared of what I was likely to experience in the hours to come if this was just the beginning. Johno on the other hand was cool as a cucumber; helping me to focus through the pain and reassuring me that I could do this; my body was built for this. 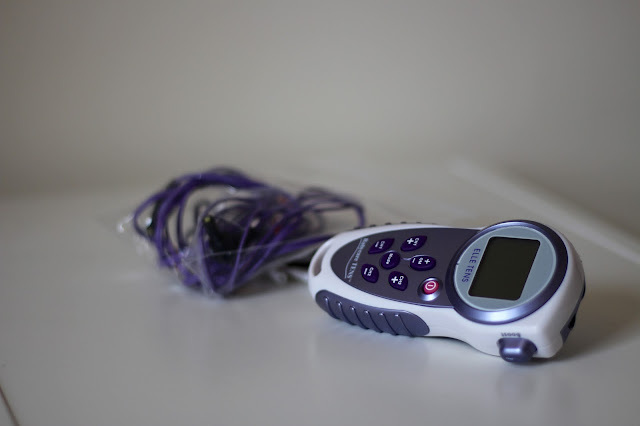 I decided about 20 minutes after my first contraction that I wanted to set up my TENS machine; I'd read the earlier you use it the more effective its likely to be throughout labour so was keen to get going. Once we'd worked out where to place the pads on my back I got the machine started and oh goodness it helped immediately... its hard to describe how it felt but kind of like I had control over administering a sensation through my body to try and override the power of the contraction. My contractions continued to get stronger and closer together so Johno started to time them using the timer function on the pregnancy app we'd used throughout the nine months. To my surprise, after about 20 minutes, Johno let me know that I'd had 3 contractions within 10 minutes; hearing this news made me feel so anxious but similarly excited as my body was telling me that things were progressing. At that point Johno suggested we call the labour ward just to check what they thought about my contraction timings and whether we needed to make our way to the hospital. He dialled the number for me and when I got through to the midwife I could hardly talk through the strength of contractions so the midwife recommended I go in just to see how I'd progressed. The midwife made a point of saying we shouldn't get too excited as I could still be in the very early stages and its likely we'd be heading back home again. We quickly ordered a taxi to the hospital (both of our arranged lifts were at the pub, tut tut!!) got our bags together and then headed to the front of our house to wait for our car to arrive. By this point my contractions were so strong all I could do to help ease the sensations was to bend over our front wall breathing heavily. The journey in the taxi is a bit of a blur for me, I just remember shouting at the driver to hurry up then apologising for shouting at him! Thankfully a midwife came to check me over pretty quickly (I think my anger helped!)... at this point I thought I was going to be told that I had hours left to go. I can't even begin to express how amazed I was to hear that actually my wonderfully amazing body had progressed to 7.5cms dilated and we were nearing the time to start pushing. So many ladies out there are going to hate me for that I know... sorry! So, we then got settled and the the pushing commenced! We were in an active labour room so I used the chairs, leaning posts and bed to try and progress further but I think a mixture of nerves and exhaustion got the better of me and I started to request pain relief. My midwife, Maria, tried her hardest to get me on the gas and air but I was having none of it.. I hated how it made me feel so after about an hour she allowed me to have some diamorphine. Before the opiate was injected into my thigh I was under the illusion that all my pain would disappear. Of course, it didn't and I just became super drowsy.. not what I needed when my aim was to be pushing the baby out within the hour. Reading up on this drug after the event I'm surprised they gave me it so late in the process; it was inevitably going to affect my ability to get the baby round the final bend before the exit! Two hours later and baby was still no closer to coming into the world.. exhaustion had got the better of me and I was beginning to panic. The doctor came to review our options and after a quick chat with the midwife they both recommended that we head to theatre for a forceps delivery. I was gutted. But knew that I didn't have it in me to push any longer so agreed, signed a few forms and was then wheeled off for the next stage of our delivery experience. Me and Johno were separated at this point; I was sent into theatre and he was sent to the waiting room to put on some scrubs. My contractions picked up intensity just as the doctor started to get all of the equipment ready to administer an epidural... she stressed the importance of me staying completely still and insisted on talking me through the whole process which didnt help with my nerves but I was told it was a requirement of having it. I vividly remember being in mid intense contraction when they started to administer the epidural; totally petrifying as all I wanted to do was move through the pain but thats totally not what I should have been doing whilst they inject near to my spine! After about 15 minutes Johno was able to join me in the theatre. I'd lost all sensation in the lower part of my body; I couldn't feel my contractions whatsoever and I was quite happily laying there chatting away to him about how excited I was to meet our baby. Meanwhile, the midwives put up a screen across my middle so I couldn't see what was going on down there and out of nowhere told us that the time had come to get the baby out and that I needed to push with all of my strength. Of course, with no feeling in my lower body I was baffled as to how I was meant to assist with getting her out; could I really push?? Of course, my pushes helped, and along with the forceps we quickly delivered little Aria Sylviè into the world at 4.50am on 10th September- I remember the doctor telling us to get ready and then all of a sudden a (in the nicest possible way) alien looking baby was lifted over the screen and placed on my chest. Johno and I both burst into tears and stared in amazement at our little one with a cone shaped head.. the poor darling. It was truly the most amazing moment of my life seeing that little babe for the first time; she looked so tiny all wrapped up in a towel. I couldn't take my eyes off of her. Whilst Johno and I were coo-ing over our precious parcel the doctors continued to work on me- because of the quick forceps delivery the placenta was a bit trickier to deliver...eventually the doctors managed to manually remove it but it meant I lost quite a bit of blood. I didn't care though.. I couldn't stop looking at our lovely daughter.. the poor little thing didn't stop crying for around 40 minutes once she'd entered the world.. but when she'd calmed down a little she amazed us both and rooted around to latch on for her breastfeed- such a gorgeous sight. The next hour or so is a bit of a blur; we were visited by a paediatrician as they were a little concerned about the cuts to Aria's forehead- the forceps had left a few wounds but after an examination they were happy she didnt need any stitches. We were then taken up to the ward at about 6am to settle and begin our journey forward with feeding, getting to know our little girl and recover from her very speedy arrival. Johno left to go home for a while and I was on such a high from the whole event I didn't manage to get any sleep; Aria was fast asleep for a few hours that day but I couldn't stop looking at her and just being totally amazed that she'd been inside my tummy all along! At around lunchtime Johno came back with my parents; they both were in absolute awe of little Aria.. it was so emotional seeing them meet their grand daughter for the first time. A moment I'll never forget! The midwives decided to keep me in over night due to the amount of blood I lost during the delivery; I wasn't best pleased about this but I knew it was the right thing to do, plus it meant I'd be able to just spend some one on one time with Aria before going home. As you can imagine, being on a ward full of new babies and mums isn't be quietest of places during the night.. it was actually rather scary if i'm honest. I had no idea what I was meant to be doing with our brand new baby, I had no idea really how I was meant to be feeding her and I don't think I realised at the time how much of an impact losing a lot of blood had on my body. I was exhausted already and I only managed to sleep for 1 hour so that first night was VERY difficult- I had so many thoughts running through my head during those waking hours; Was i really cut out for this? Is this how every night would be for months and months? Would I really be able to breastfeed after leaving the hospital? The next morning little Aria and I were discharged from the hospital; although I was desperate to get out of that place it was pretty daunting leaving the safety of the midwives; but I knew having my parents at ours for a week would be so comforting for us all. I've got so much more I want to write about in relation to our first week at home, breastfeeding challenges, our most useful items we used in the first few weeks, my view on what you really need to pack in your hospital bag and much much more so I'll end this post here and continue as and when I can. Six weeks into being Aria's mama I can for sure say its been the most challenging experience of my life but at the same time THE most rewarding thing I've ever done. What a lovely read Holly, I should think it was a nice thing to write as well, it will be nice to look back on too as we all seem to forget so much in the mists of time! Well done to you all and what an amazing journey you have ahead!